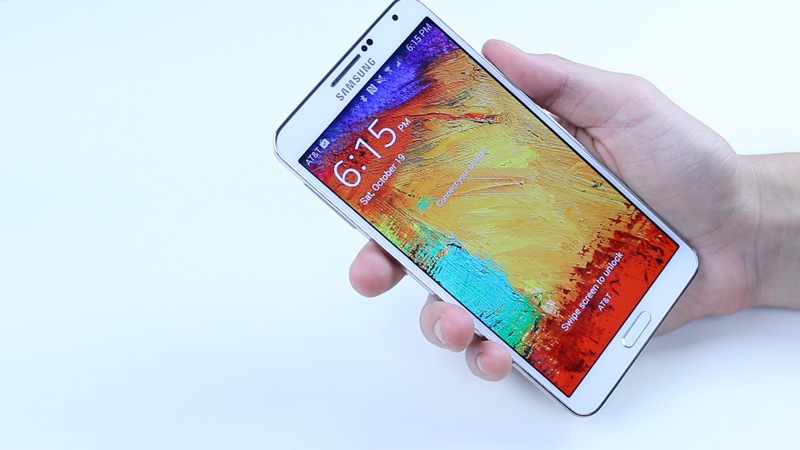 The Samsung Galaxy Note 3 is Samsung’s latest in its Note lineup and it’s without a doubt the best yet. Straight off the bat you can see the new phoe leather back and the slightly larger 5.7 inch display which towers over smaller devices like the iPhone 5S. Despite the phone’s enormous size, it’s surprisingly light, weighing in at only 168 grams. Like the previous Note and most other Samsung phones, the device has a removable battery, micro sd card slot, and can be bought from ATT in only a 32 GB model. 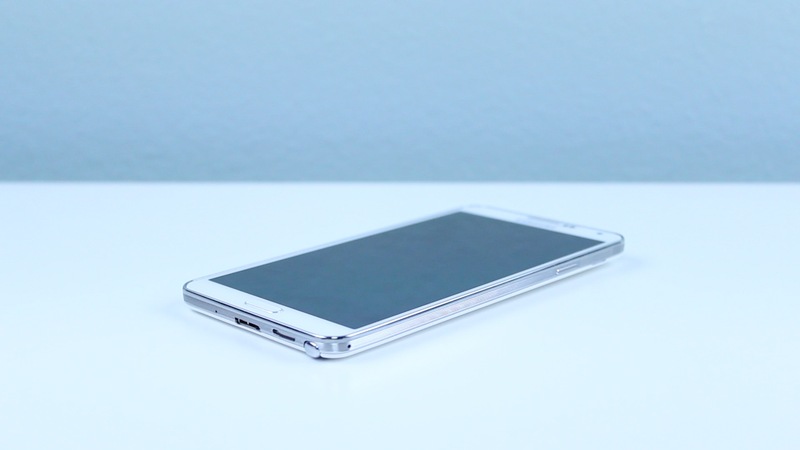 The Galaxy Note 3 is one of the fastest phones we’ve ever seen, it’s powered by Qualcomm’s latest Snapdragon 800 processor at an ultra fast 2.3 GHz. Included with the Note 3 is a baffling 3GBs of ram which means the Note has no problem flipping back and forth between multiple applications. On the right side of the handset you can find a single power button with a nice silver finish and on the left the volume rockers, which seem a bit too high up on the device. I would’ve preferred them a tad lower as it would make one handed use a bit easier. One major addition is the micro usb 3.0 port which is on the bottom of the device. It allows for quicker charging speeds and also faster data transfer. When purchasing the Note 3 you’ll receive a special USB 3.0 cable, but it can also be charged with your standard micro usb. The single speaker is also found on the bottom instead of the back, which is a welcome change, but it’s still no where near as loud as HTC One’s boom sound. 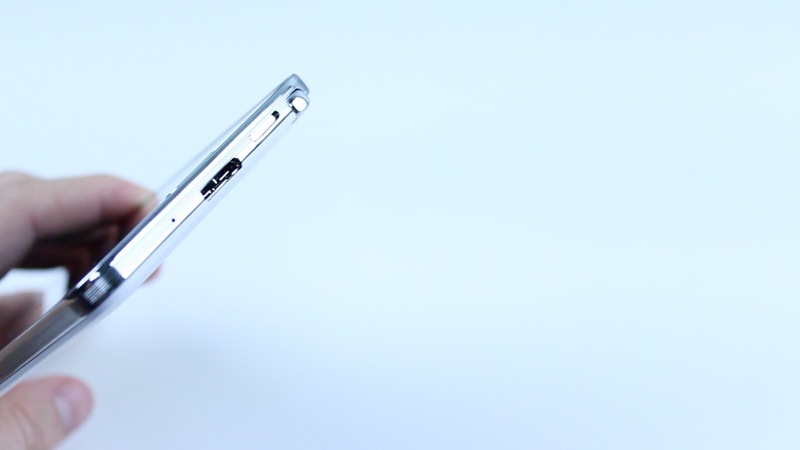 Of course the main feature of the Galaxy Note 3 is the S Pen. While it’s a ton of fun to show off to friends and family, I find myself rarely using it in real world situations. Of course people that are interested in art and note taking may find it useful, but buying the device simply to have the S Pen probably isn’t the greatest idea. One major change between the Note 2 and 3 is the back cover. Samsung ditched the plasticky cheap feeling back for a more modern, slightly better feeling phoe leather. It’s certainly nicer than the old plastic feel, but it’s far from leather. In fact, it’s more of a textured layer over the plastic back that we’ve seen on previous Samsung handsets. That’s not to say it’s a bad thing though, it’s definitely an improvement as it keeps the removable battery and micro sd card slot while still enhancing the overall user experience. 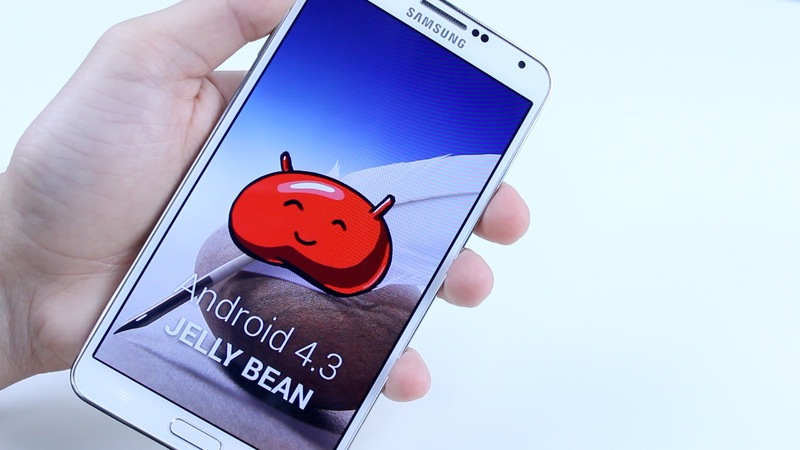 The Galaxy Note 3 is on the latest version of Android, 4.3 Jelly Bean, and should be updated to 4.4 Kit Kat soon after release. My favorite feature of the Note 3 is its multi window which allows you to have multiple windows open at the same time. I myself often watch a YouTube video and have my browser open at the same time, this can easily be done with the Note 3’s large 5.7 inch display. Even with this huge display and the super fast ATT 4G LTE I was able to get fantastic battery life, in fact I couldn’t even come close to killing it in one day. The screen on the Note 3 is absolutely fantastic. I’m a fan of large displays but the screen on the Note 3 honestly blows me away every time I unlock the device. It is amoled which means it is a bit oversaturated and at times can be tough to see when in direct sunlight. Other than those few gripes it’s definitely one of the best. While the camera on the Galaxy Note 3 is essentially the same as that of the Galaxy S4, it isn’t a bad thing. As expected, pictures look great in well lit locations, while it underperforms in low lighting. On the video side of things, the US Note 3 supports 4K video which means it’s ultra clear and looks great even in 1080P, the downside is that there’s no optical stabilization so video comes out quite shaky. 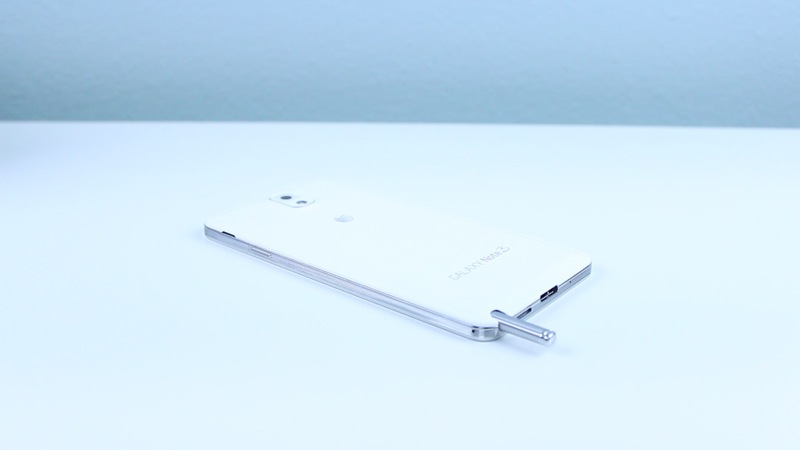 For more info on the Samsung Galaxy Note 3 you can check out the video below.